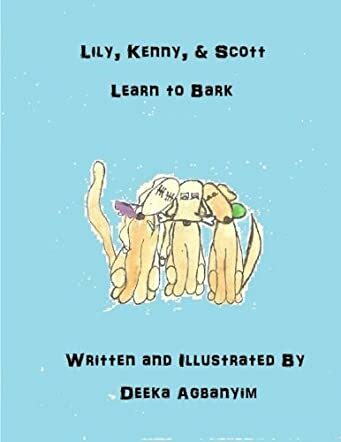 Readers are introduced to Lily, Kenny, and Scott having fun in the backyard one sunny afternoon in the opening scene of Lily, Kenny, & Scott Learn to Bark by Deeka Agbanyim. Lily smells the flowers, Kenny is tossing the ball, and Scott is chewing his bone. They are bored and they decide to go for a walk, but Mother Dog does not let them do that as she feels they are young and cannot protect themselves. They decide to prove themselves to Mother Dog and so each one of them barks to show her they can take care of themselves. Mother Dog is not convinced. Scott’s bark sounds like a quack and Lily and Kenny laugh at him. The next day Mother Dog makes them bark again and again Scott does not sound like a dog. Will Scott bark like a dog? Read the story to find out. I love the message and the concept, and the story is uplifting for all young readers out there who doubt their abilities. The illustrations are colorful and they give the characters personality and the story good movement and clarity. Leo the cat is as adorable as Lily, Kenny, and Scott. The message and concept of the story make it an excellent storybook for read aloud and story-telling sessions in classrooms as Scott’s character will encourage children not to feel embarrassed if they cannot do things they are supposed to be able to do. The story will also motivate children to try, try, and try again.